SCADACore’s Remote Video Surveillance solutions offer affordable, high-quality images and video feeds. SCADACore can provide a visual display for all your data, including surveillance footage and images. Know what is happening all the time with scheduled and motion activated surveillance video. SCADACore remote surveillance / closed-circuit television (CC TV) solution is more than simply security. With motion activate Surveillance video users can be provided with real-time visual notifications if there is a remote failure on site. Water levels and air quality can be visual inspected from thousands of miles away keeping your residents and employees safe. Secure surveillance on remote sites with high quality, real-time, night-vision motion capture images and videos. Visually track water levels in rivers, streams, reservoirs, or lakes for less than the cost of one trip to site. Save thousands of dollars in cleanups fees by visually checking for leaks or spills which are impossible to monitor with other means. Provide added safety for your employees who can view site conditions before arriving on-site. Ask about our live video options that are suitable for all weather conditions. For short-term construction or oil and gas service projects online portable gas monitoring can be used to detect toxic or explosive gases in the area. Data is streamed in real-time using the Sentinel reporting system and is 100% compatible with the Sentinel Alarm Station allowing users on-site to receive visual and audible alarms. SCADACore designs perimeter monitoring and onsite real-time reporting of hazardous gases such as H2S, LEL, SO2, CO, CO2. The webpages can use the SCADACore dashboard and custom publicly available webpages such as the pembina air monitoring system. By setting callouts on high level alarms, SCADACore can alert onsite personel within seconds of possible toxic gas exposure. 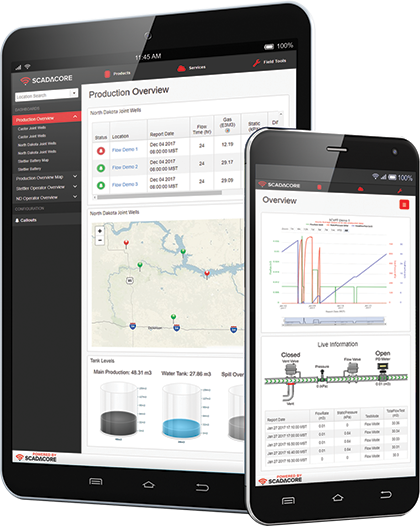 SCADACore continuously develops new and innovative monitoring solutions to keep workers safe. The SCADACore CloudDock system allows users to remotely review logs of devices such as the BW Microdock system. This auditing ensure that all employees are following gas monitoring procedures to sure their personal safety devices are working optimally. Utilizing the embedded sentinel hardware SCADACore can provide real-time alarming and historical archives for commercial properties. Common gases are carbon monoxide for parking garages and methane and other LELs for locations near landfills. Do you want more information on SCADACore’s Surveillance solutions? Do you have remote assets that you need to ensure are secure? Does your industry have a potential for expensive environmental cleanup and need a visual method to ensure it is safe? Do you need to visually identify remote environmental conditions?